[Ottawa – June 12, 2018] After an exciting campaign, the 42nd Ontario general election has come to a close. We at EKOS believe we did a very good job in charting the direction of what was one of the most unusual election campaigns in recent memory. We first noted on June 1st that, barring significant changes, Doug Ford’s Progressive Conservatives appeared headed for a majority government. The race remained relatively stable in the final week and we affirmed this prediction on June 6th. Furthermore, we captured the popular support of all four contenders to within the margin of error. The goal of our seat forecast was not so much to predict the number of seats that each party would win on election night, but rather to predict correctly as many individual seats as possible. We correctly predicted the outcomes in 113 of Ontario’s 124 ridings, an accuracy rate of 91 per cent. As with our seat forecast for the 2015 federal election, our seat-by-seat predictions appear to be one of the most accurate when compared to other seat prediction models and forecasts. Our forecast predicted a PC majority of 73 seats, with 45 New Democrats, five Liberals, and one Green. 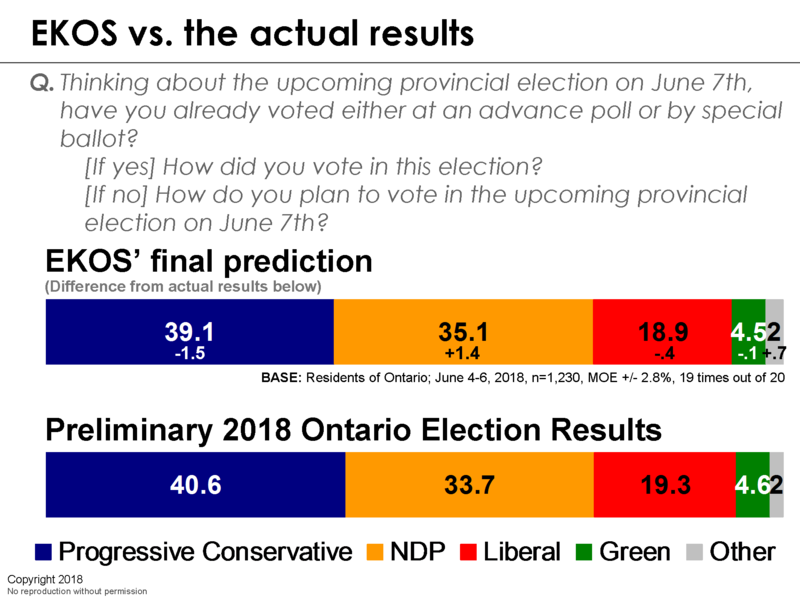 We slightly underestimated both the PCs and the Liberals and overestimated the New Democrats, as their final seat totals were 76, seven, and 40, respectively. We noted in our release that the Liberals ‘could win a few more’ seats and this was indeed the case. The biggest surprise of the night was Orleans, where we predicted an easy PC win, yet the Liberals won by a four-point margin. In closing, we would like to thank the 6,191 Ontario residents who generously responded to our surveys over the course of the election campaign. We would also like to thank those who have provided advice, comments, and feedback throughout the election, particularly in the world of social media. We also congratulate the polling community and the excellent work they did, with a special nod to the other IVR pollsters – Mainstreet and Forum – who, along with EKOS, provided the most accurate predictions of the final election outcome. Finally, we acknowledge all those who participated in the political process and recognize the passion and effort that they bring to Canadian democracy. Doug Ford and the Progressive Conservative Party of Ontario are to be congratulated on having won a clear and decisive mandate to lead Ontario. Please click here for a PDF copy of this report.